MS Glass fiber filter are made by 100% borosilicate glass, with retention levels extended into the submicron range. These depth filter combine fast flow rate with high loading capacity and retention of fine particulates. 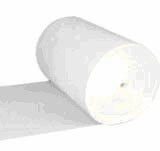 Now fiberglass air filter media rolls and pads are available for you. Such kind of product provides premium performance with extra strength. The special frame design ensures corner integrity during handling, installation and operation.